The Fair 2014: Last chance to use The Daily Spin! Many penguins were upset about the price of fair prizes. They were also upset because it was too difficult to win all of the free prizes at The Daily Spin. Today is the last day to win anything from The Daily Spin. Let's see what I win...wait what?! 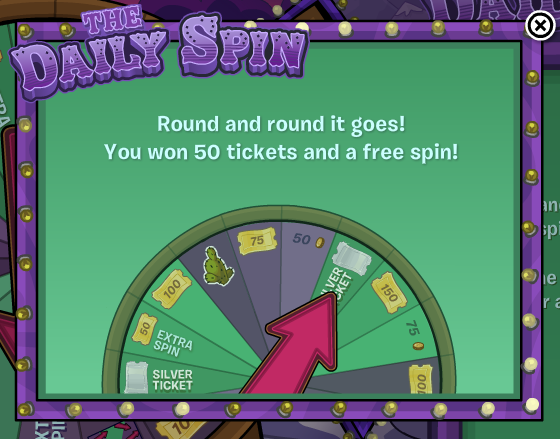 I got a free extra spin and 50 tickets! AWESOME! Since I got an extra spin I will try and spin again! OH NO! I wasn't so lucky this time. 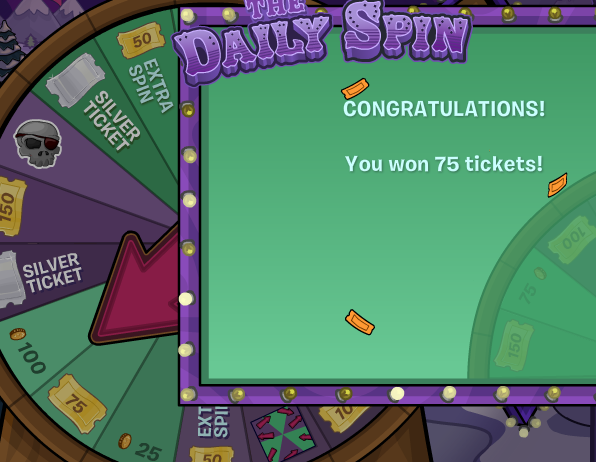 It says I won 75 tickets even though the arrow is pointing more toward the 100 coins. I guess it's better than nothing! Go try The Daily Spin today (since it is the last day) and leave a comment on this post on what you won!